My name is Abe Hideyuki. of 528Hz by ACOON HIBINO not only in Japan, but also to the whole world. We make our own 528Hz music from original songs to Japan and worlds ' classics that covered in 528Hz. We hope that Japan’s classics in 528Hz will spread all over the world. that supposed to create harmony with nature by itself through the healing effect of sound in 528Hz. That is why it’s named as OTO (sound/music) BOTOKE (Buddha/ heart of believing). It is said that the world of languages/words start from the sound of "ah" and ends at itself. Originally, languages and words are sound, which is part of music. and to tell the world the beauty of Japanese heart which is disappearing nowadays. We, OTOBOTOKE and ACOON HIBINO’s 528Hz, look forward to see you somewhere soon. Producing music in 528 Hz by ACOON HIBINO, which won the prize of Japan Record Award. Facilitating collaboration with other famous musicians. stress care, mental care for athlete, and etc. Advertising and researching about music in 528Hz, through the collaboration with renowned doctors and researchers. ACOON HIBINO composes and produces music in 528Hz to express Japanese traditional culture, seasons, changing sceneries and time. Planing to translate Japanese traditions, celebration, rituals into 528Hz music and to share it with the rest of the world. Other than that, there will be collaborations with videos and event of promoting the effect of 528Hz to human bodies. Hibino has started incorporating 528 Hz, which is recently called “frequency of love”, into his performance and released his major debut album 『comfort your mind and body～frequency of love 528Hz～』from Teichiku Entertainment in Jan, 2015. In July 2015, the second full album 『Prescription of melody--Balancing the autonomic nerves～frequency of love 528Hz～』was released. It recorded a great hit, despite the fact that CD doesn’t sell in the recent music industry. He composes 528 Hz based on both music theory and medical view point. His approach is greatly acclaimed and awarded with Japan Record Award. He was born in Shiga prefecture. 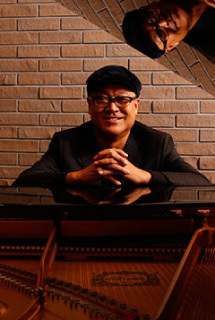 1981 Hibino started playing piano and composing when he was a student at Kansai Gakuin Univerisity. 2009 The first solo album 『Souvenir』was released. 2012 Invited to perform at the event of promoting friendly Sino-Japan relation organized by Ministry of Foreign Affairs of Japan, in the largest concert hall at Hong Kong. 2013 Started incorporating 528 Hz which has a soothing effect in his performance. 2014 Released the album『ZEN PIANO -Master528』.Performed in the Jazz Festival held in Portland, USA. 2016/Apr. Produced album exclusively for dogs 『Dog’s Peace～frequency of love 528Hz～』with clinical trial. 2016/Jul. The 12th song 「FUTUREs」in the album『Balance the Mind and the BodyⅡ～frequency of love 528Hz～』is selected as the theme song for Beppu Onsen( the famous hot spring spot in Japan). 2016/Sept. Founded exclusive record lable company, OTOBOTOKE, INC.
We wish our 『functional music』 will reach out to more people and artists all around the world. We are now looking for coworkers/supporters to make 528Hz worldwide. COPYRIGHT © OTOBOTOKe, INC. AllRIGHTS RESERVED.